Matthew and Sarah Taylor were having secret meetings with Crush Collective designers in the kitchen of their eclectic midcentury rambler in Arden Hills before they even closed on the house. Matthew had grown up down the street, where his parents still live, and his real-estate agent mother alerted the couple that the house was going up for sale before it hit the market. They hadn’t been looking to move, but the home’s history, midcentury modern architecture, excellent entertaining spaces, and proximity to their kids’ grandparents sealed the deal. The house was built in 1959 by a former director of Northrop Auditorium who loved to host festive pre- and post-show parties for artistic luminaries, many of whose signatures (including Guthrie Theater founder Tyrone Guthrie and singer Marian Anderson) still grace a wall in the old bathroom. The unique home came complete with a live indoor atrium, a stage for performances, and a hidden bar. The challenge for the designers, Kristin Rackner and Kimberly Scanlon, was how to update the kitchen, which had been transformed by a 1990s remodel into a space not exactly conducive to the life of a busy family of five. “I called it kitchen jail,” says Sarah of the U-shaped counter that contained all the vital kitchen work areas. “If anyone else was in there with you, you were like, ‘Get out, get out!’” Not ideal for the mother of three girls, all of whom love to cook. 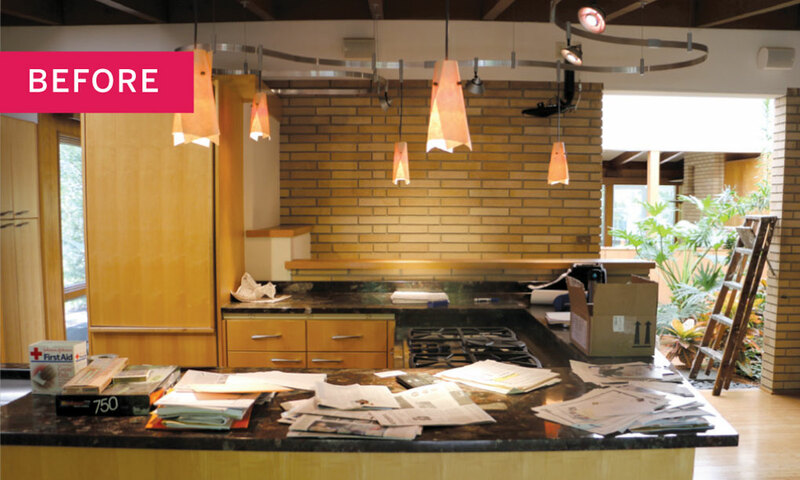 Above: A “Before” image of the kitchen shows a cramped and cluttered space. So the “kitchen jail,” with a double oven and hulking fridge in the middle of the room, had to go, as did an ill-placed corner doorway that led to the detached garage. The designers set out to preserve, restore, and honor the home’s midcentury architecture and design elements (including the hidden bar, an exposed brick wall, and white-paneled ceiling), while updating some of the more questionable 1990s choices, including snaky, dropped track lighting that hung down below the original dark wood beams, making the whole room feel smaller and dimmer. Above: Sarah Taylor and her daughters—all of whom love to cook—share the kitchen and indoor atrium. “The kitchen didn’t represent its midcentury roots when we started,” says Rackner. “We wanted to reel it in and bring it back to the history of the home, while incorporating the white, clean lines of Scandinavian design, where everything can be put away. There’s a place for everything in this kitchen.” The designers put extra care and attention into the appliance garage and mail center—two utility spaces that can be tucked away behind closed cupboard doors, or opened up and pulled out to provide access to the microwave, coffeemaker, toaster oven, Nespresso machine, and office supplies. The nicely organized counter space and office nook would put Martha Stewart to shame. 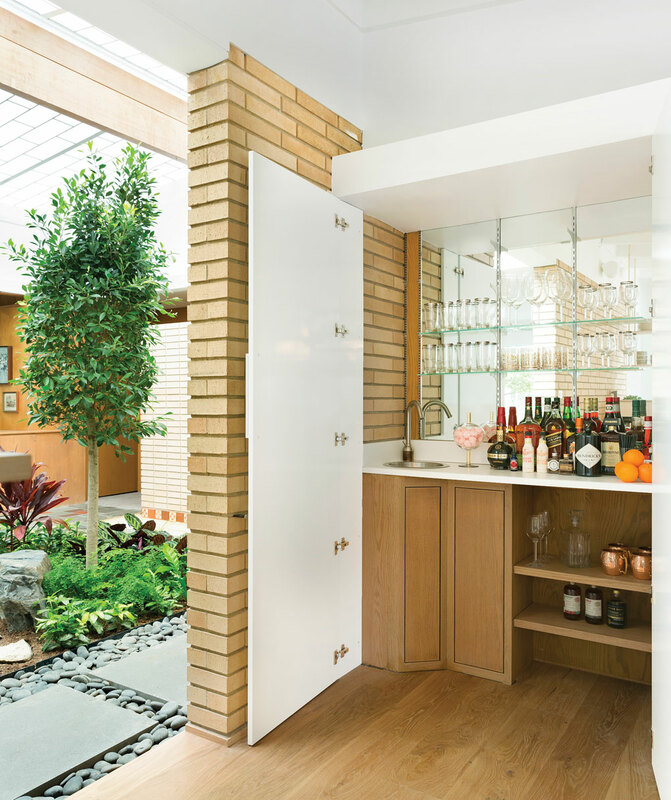 Above: The designers preserved the ambiance of the 1960s-era bar, which can be hidden away behind folding doors. The floors were replaced with white oak with a natural Rubio Monocoat oil finish, and the ceiling beams are now the same gleaming white as the countertops and cabinets. Suspended track lighting recessed between the beams makes the ceiling feel higher and brighter. 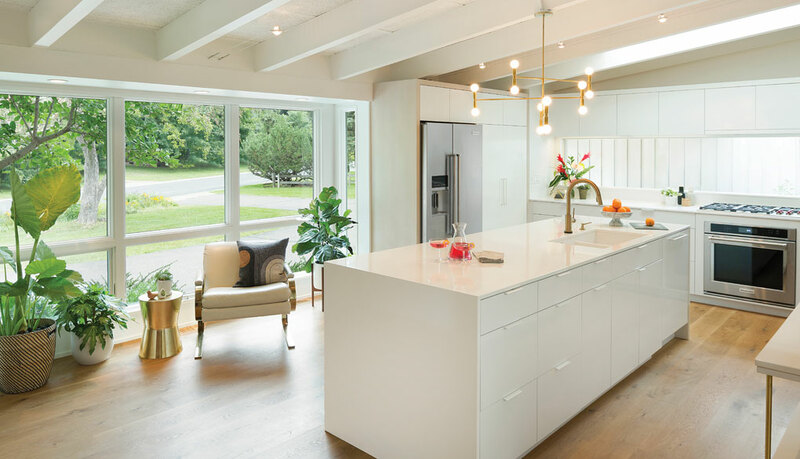 The custom cabinetry by Northfield-based Nest Woodworking, concealed range hood, and embedded stovetop that leaves the counter edge unbroken all contribute to the clean lines and open, airy feel of the space. The eliminated corner door was replaced with additional cupboard space. Now when the kids get home from school in their snowy boots, they enter the house through a door by the mudroom. “The kitchen can just be the kitchen,” Sarah sighs happily. A long linear window that runs the length of the room along the cooktop counter floods the space with light, and suspended shelving, which nicely echoes the gleaming brass light fixture, opens up the sightlines for the whole room. Mo Perry is a freelance writer and actor. She is co-founder of Logosphere Storysmiths and has also written for The Atlantic, Minnesota Monthly, METRO Magazine, and more.